How do you define an authentic life? For me, it's about self knowledge and self awareness, living mindfully in the moment, and making the best, healthiest decisions for myself and, where appropriate and not intrusive, my loved ones. It's about recognizing the natural world around me, and understanding my place in that world. It's about being the very best, most authentic self I can be as an individual, as a member of my family and of my community. How is a fragrance oil different from an essential oil? In my earlier post, we saw that essential oils are highly concentrated fragranced oils extracted from plant life. What then, is a fragrance oil and how is it different? Is one better than the other one? A fragrance is a chemical compound that has a smell or odor. Some of the chemicals come from natural scents (i.e., from plants and animals); others are synthetic, and are blended carefully to create the desired fragrance. So, while all essential oils can be considered fragrance oils, the reverse is certainly not the case. Why would I want to use a synthetic fragrance oil? Isn't natural always better? Safer? Going all natural and usually only products fragranced with essential oils is a valid choice. However, it's worth bearing in mind that many lovely fragrances are just not available in essential oil form, or are just cost prohibitive. For instance, I personally love the smell of sandalwood (and so do my customers), but the cost of the essential oil is simply astronomical. Some of my most popular fragrances are available only in fragrance oil form (i.e., pumpkin, cranberry, cherry almond, etc.) 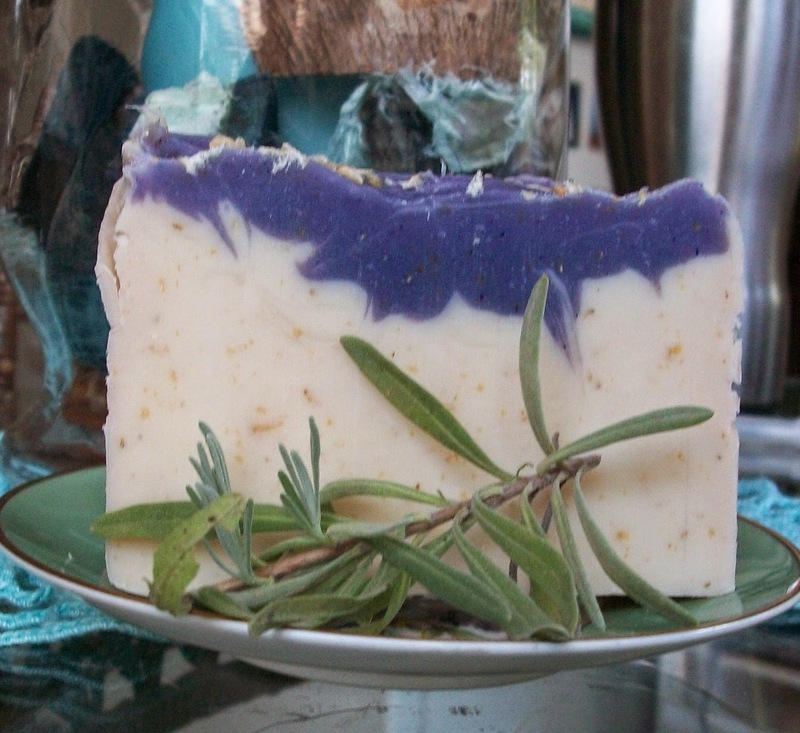 The soap below is a blend of lavender fragrance oil and a lovely fragrance oil called "Oatmeal, Milk & Honey". Is it safe to use a synthetic product on your skin? In soapmaking, this is a crucial question. Fragrances (and the chemicals that make them up) are guided by the Research Institute for Fragrance Materials (RIFM), RIFM is a comprehensive resource for safe use and exposure information on fragrance materials found in perfumes, cosmetics, shampoos, creams, detergents, candles, etc. I have found that it really pays to do your homework here, and I shop for fragrance oils only with respected, time tested vendors. Some fragrances are perfectly safe to use in candle-making, but are not skin-safe. If you are shopping for fragrance oils, a reputable vendor will provide this information before you buy. If you are shopping for products made with fragrance oils, it's perfectly valid to ask about these sources. For more information on fragrance oils, visit Brambleberry's Soap Queen blog. I am a soapcrafter and lotion blender, naturalist and conservationist; craftswoman and urban homesteader. I see the beauty and the magic of the natural world everywhere and I believe that our re-connection with this world enhances our minds, bodies and spirits. It is my mission to bring that philosophy into my products.